Kit Contents: Photometer 7100 instrument, 8 glass cuvettes (PT 595), dilution tube (PT 512), 10 ml syringe (PT 369), test tube brush (PT 663), 10 crush/stirring rods (PT 502), instruction manual and Palintest System method book. Supplied in a hard case with space for up to 8 reagent Starter Packs (PM code). The perfect field photometer for drinking water testing, wastewater/effluent and environmental analysis, the Photometer 7100 provides the complete range of test parameters in a waterproof package. Waterproof to IP67 to protect the instrument in all environments – it even floats! 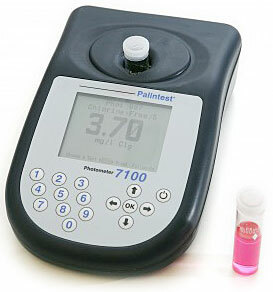 The Photometer 7100 is part of the Palintest multiparameter photometer range and is provided in a choice of two kits, both with space for Palintest reagents and all accessories required for operators in the field. Part of the Palintest multiparameter photometer family, the Photometer 7100 is a portable colorimeter or photometer packed with features to support field users. Supplied with 3 x ‘AA’ batteries, users can open the case and immediately begin testing drinking water, wastewater and process water anywhere field water analysis is required. Available in either the Photometer 7100 Kit or the Photometer 7100 Engineers’ Kit, either will provide a robust field platform for water testing in all locations. More details can be downloaded below or log-in to our Know area for application notes, hints and tips and other additional support material. Select the method required by scrolling through the extensive list, entering the three digit code or by choosing from the favourites list on the Home Page to start testing. Data is clearly reported on the large LCD screen with backlight. For power saving, the backlight can be manually operated or automatically switched off after a period of inactivity. The instrument only requires a blank sample once – all wavelengths are blanked at the same time and the value retained within the instrument memory until updated. The adaptive cell holder simply clamps and centres cuvettes with a diameter range of 12 to 20 mm – no adaptors or fittings are required. The Photometer 7100 is provided with a two year warranty as standard and supported by field validation standards, service and calibration. Photometer Tablet Reagents For ultimate convenience and ease of use, tablet reagents are available in either Starter Packs (PM) or Replacement Packs (AP). Parameters available range from alkalinity, ammonia, calcium hardness, chlorine, nitrate, pH, total hardness and zinc. All Photometer Tablet Reagents are compatible with the Photometer 7100. Tubetests® Reagents Formulated reagents packaged in barcoded tubes and supplied in packs of 25 tests. Applications include Chemical Oxygen Demand (COD), nutrients and heavy metals. All Tubetests® Reagents are compatible with the Photometer 7100. Photometer Liquid Reagents For speed of analysis and high volume applications, liquid reagents are ideal. DPD in liquid reagents for free, combined and total chlorine plus Dissolved Oxygen (DO) are available. All Photometer Liquid Reagents are compatible with the Photometer 7100. Photometer Accessory Reagents Predominantly used for suppression of interferences in specific sample conditions, accessory reagents can be tablets, powders or liquids and are designed for use with the Palintest System. All Photometer Accessory Reagents are compatible with the Photometer 7100. PT 595/5 Photometer Cuvettes Pack of 5 glass cuvettes with caps – 20 mm OD, 77 mm tall with 10 ml graduation.